Wind whips through your hair as you rip around the corner of Germany’s famed Nürburgring racetrack in your Ferrari Formula 1 race car. You accelerate hard out of the turn, pushing the car to its limits, overtaking yet another driver. Pistons fire, tires squeal and the engine screams as you charge past the competition. The checkered flag waves in the distance. You can see the ending in sight – the sweet taste of victory teases the tip of your tongue. You barrel towards the finish line when suddenly … you wake up. You realize you’re not an F1 driver, and you may never know the rush of pushing these sophisticated machines to the very limits of their abilities. That is, until now. 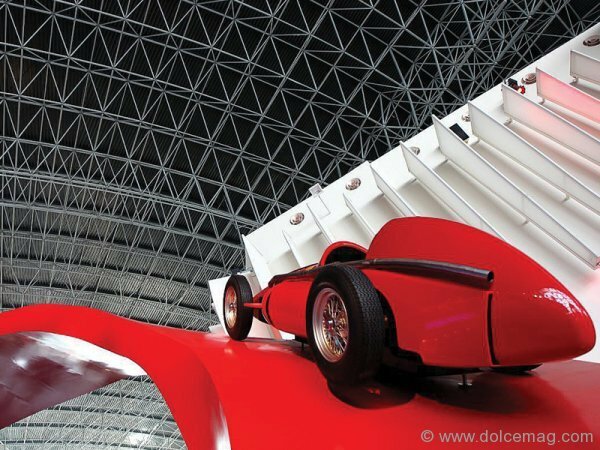 Opening this past November, Ferrari World is the first amusement park dedicated to the iconic racing brand. 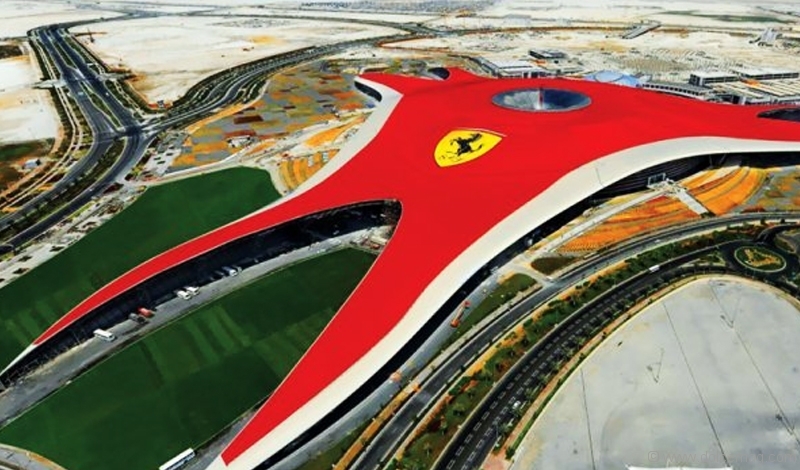 With the world’s biggest Ferrari logo detailed on a 200,000 square metre roof, this colossal shrine to the Ferrari name is the largest indoor amusement park on the planet. 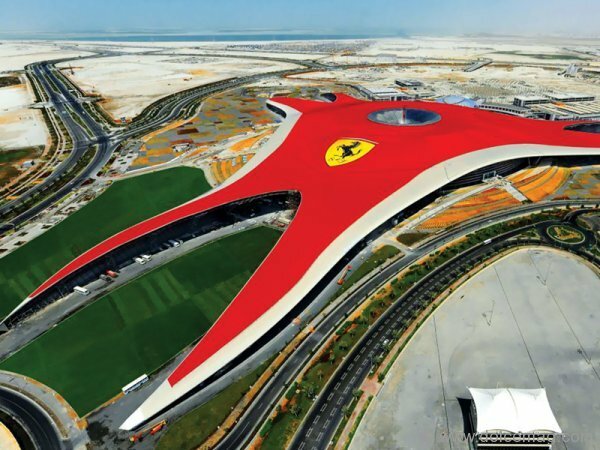 Located in the cosmopolitan metropolis of Abu Dhabi, the gigantic Ferrari red roof houses over 20 rides and attractions, giving a glimpse into the past, present and future of the racing and automotive empire. Immerse yourself in the world of racing and get a first-hand look at a range of classic and historic Ferraris in the Galleria Ferrari. 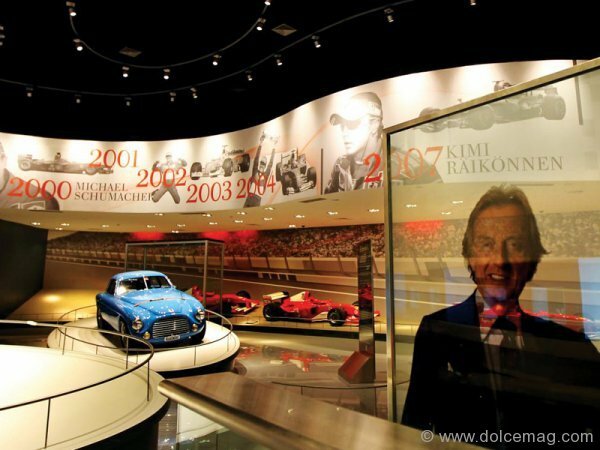 Enjoy the exclusive privilege previously reserved for Ferrari owners by touring through the Maranello factory on the Made in Maranello attraction. Jump into the driver’s seat of an adrenaline-pumping race simulator on the Scuderia Challenge – just like the ones used by Ferrari’s F1 drivers. Or let your child enjoy the thrill of victory in a scaled-down F430 GT Spider at the Junior GT attraction. For those looking for a real taste of speed, one of the major selling points and greatest achievements of Ferrari World is the blisteringly fast Formula Rossa roller coaster. Manufactured to simulate the experience of riding in an F1 race car, the Formula Rossa reaches a top speed of 240 kilometres per hour, making it the fastest roller coaster on the planet. Using hydraulic technology, similar to those that launch fighter jets off aircraft carriers, riders will experience the equivalent of 10,000 horsepower as they are rifled 52 metres into the air and feel the pressure of rocketing at 4.8 Gs – the same G-force an F1 driver experiences. Although Ferrari focuses on speed and power for its cars, there is still plenty for the entire family to enjoy. Indulge in traditional Italian cuisine at the Mamma Rossella restaurant, named for the family restaurant in Maranello that Ferrari drivers and management frequently visit, or dress your family in racing attire and memorabilia at the Ferrari Past and Present store, modelled after Enzo Ferrari’s first garage. PLEASE NOTE: The Foreign Affairs and International Trade Canada website states that as of Jan. 2, 2011, a visa will be required to enter the United Arab Emirates for tourism and business purposes. Canadians planning to travel to the UAE after this date should contact an Embassy of the UAE for details on how to obtain a visa.